Historically, media companies and subscription services alike have noticed a discrepancy between the ways younger and older consumers behave. The former are more technologically savvy, using online and mobile services at a rapid pace. Meanwhile, the latter have been reluctant to adopt new forms of media. This has created a problem for news organizations, especially those funded through subscription billing. News is one of those commodities consumed by all generations, but because of these behavioral differences, publishers have had to choose between focusing on one market over another. If they try to capture both at the same time, they risk spreading themselves too thin. Luckily, the differences between young and old news consumers are disappearing, meaning online news sites can start using one strategy to target both demographics. According to a recent study from the Pew Research Center, growth in mobile news consumption is strongest among Americans ages 50 and above. Specifically, 67 percent of adults 65 and older now consume news via a smartphone or tablet, compared to 43 percent in 2016. Of adults aged 50 to 64, 79 percent now read the news on a mobile device compared to 63 percent last year. 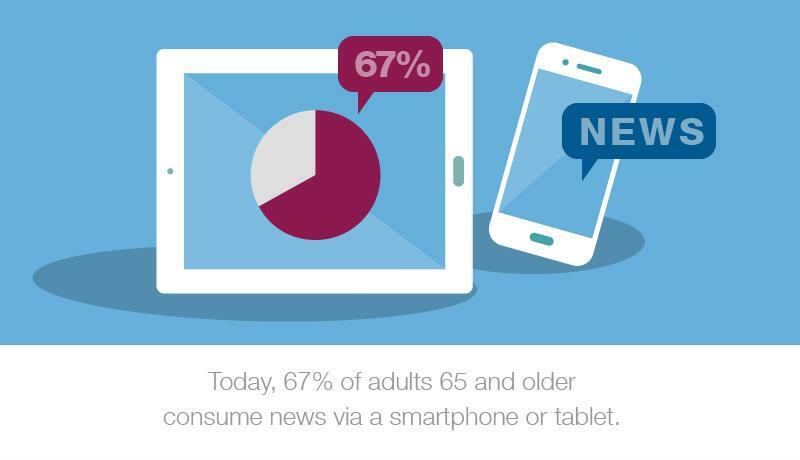 Older adults are turning to mobile devices for news and content. This trend is also seen in over-the-top video. As FierceCable reported, the Wall Street research firm Barclays noticed people over 50 are consuming more OTT content than ever before. Viewership rates increased 45 percent among adults aged 50 to 64 and 36 percent among those 65 and older. This uptake is primarily due to an increase in mobile device ownership among older consumers. The majority of middle-aged and young adults already owned smartphones and read mobile news sites. Now that older adults are purchasing more mobile devices and doing the same, publications can focus their efforts on creating or strengthening their mobile news and online video options. "Older adults who get their news from both mobile and desktop sites prefer the former." Google has pushed for websites to become mobile-friendly for the past few years. Its recent campaigns include a move to index mobile-ready sites first, according to Search Engine Journal, and the launch of a new mobile site developer certification program. Yet, some companies have been slow to follow Google's lead. For media publications targeting older consumers, this lack of urgency was understandable. Now that research shows older adults are turning to digital channels, however, publishers no longer have to choose between online and traditional print or television. Here, a mobile-first approach, rather than simply an online one, is best - Pew noted that older adults who get their news from both mobile and desktop sites prefer the former. It stands to reason that, since older Americans primarily use smartphones and tablets to consume the news, they're willing to pay for it through these channels as well. That's why it's even more important for publishers to use a subscription billing service that accepts mobile payments. What has Prime Day taught us about subscriptions?